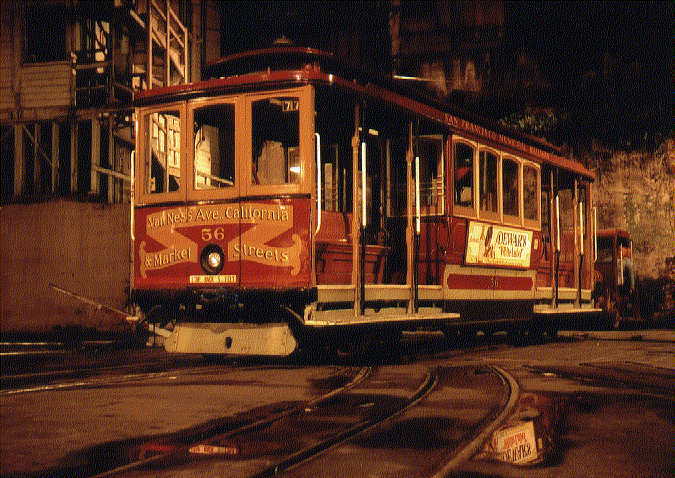 This page has some additional photos of the California Street Cable Railroad's lines. 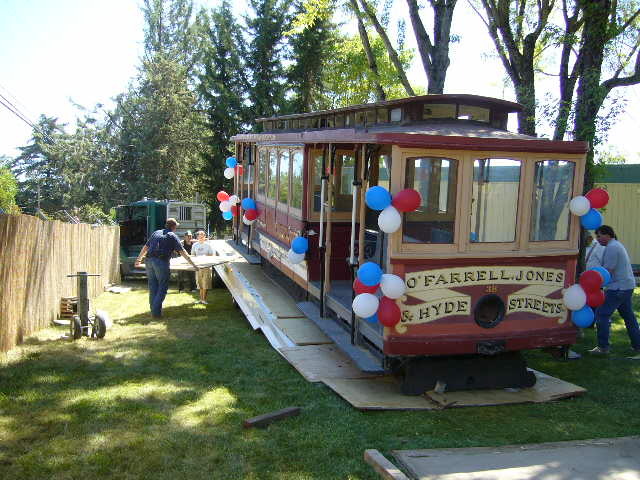 O'Farrell/Jones/Hyde car 38 leaves the shelter which covered it for many years. Decorations include a banner from the Lake County Historical Society. Gordon Miller photo. All rights reserved. 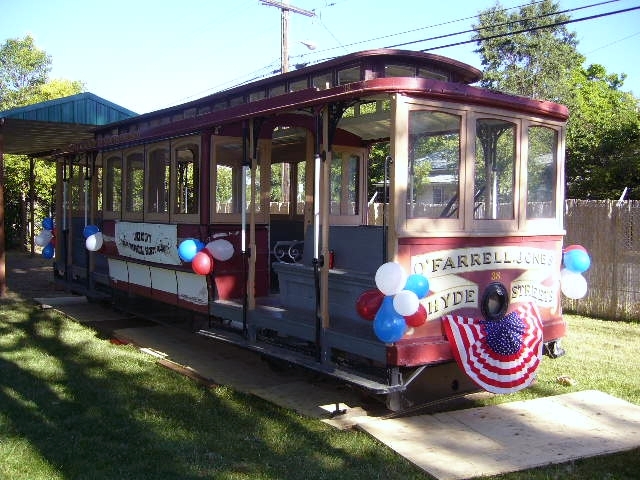 In 1958, the Municipal Railway sold California Street Cable Railroad O'Farrell/Jones/Hyde car 38 to "A party in Lakeport, California." (Inside Muni, McKane and Perles). The car was on display for many years at the Lake County Fairground. Despite being in the open air under a small open-sided shed, the car was in remarkably good shape. In 2005, Muni Gripman Val Lupiz reported that "Interestingly, the track brake shoes are still intact, the brake handles are still operational, and the interior is in very good condition." Gordon Miller is a Muni gripman whose father was a California Street Cable Railroad gripman. On 03-August-2007, Gordon travelled north to see car 38 move for the first time in many years. The Lake County Historical Society moved the car inside for renovation and a more accurate paint job. Gordon sent them photos of O'Farrell/Jones/Hyde car 42 as a reference. Looking towards car 38 from the winch which is hauling it up onto the trailer. Gordon Miller photo. All rights reserved. Car 38 climbs an incline for the first time in many years. Gordon Miller photo. All rights reserved. 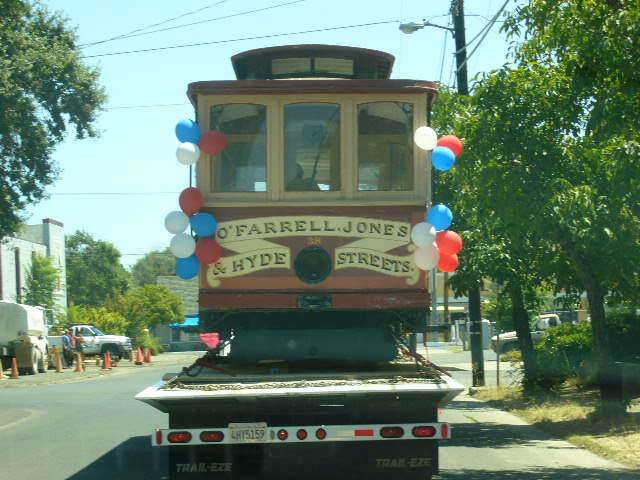 O'Farrell/Jones/Hyde car 38 rides down a street in Lakeport. Gordon Miller photo. All rights reserved. 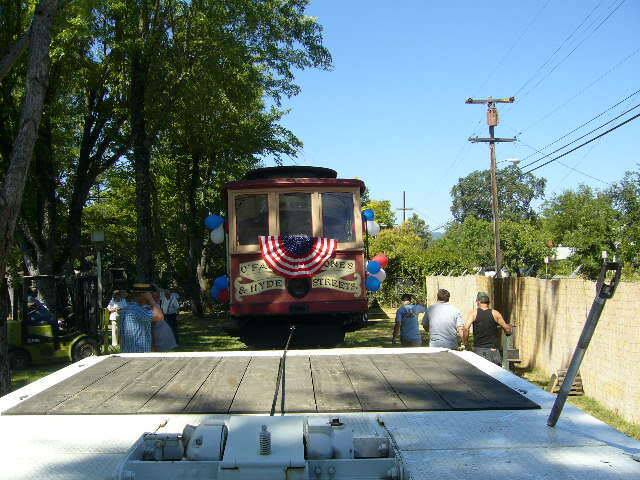 A broadside view of car 38 on the trailer, in beautiful Lake County. Gordon Miller photo. All rights reserved. 38 climbs a real hill. Gordon Miller photo. All rights reserved. 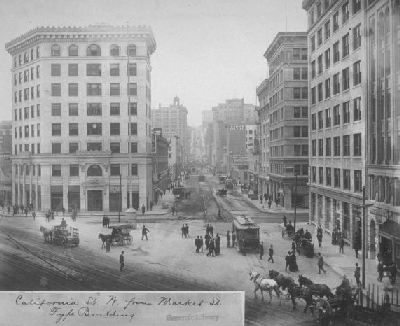 Because of the construction of the Broadway Tunnel the California Street Cable Railroad’s O’Farrell, Jones and Hyde Street cable line was discontinued north of California Street. 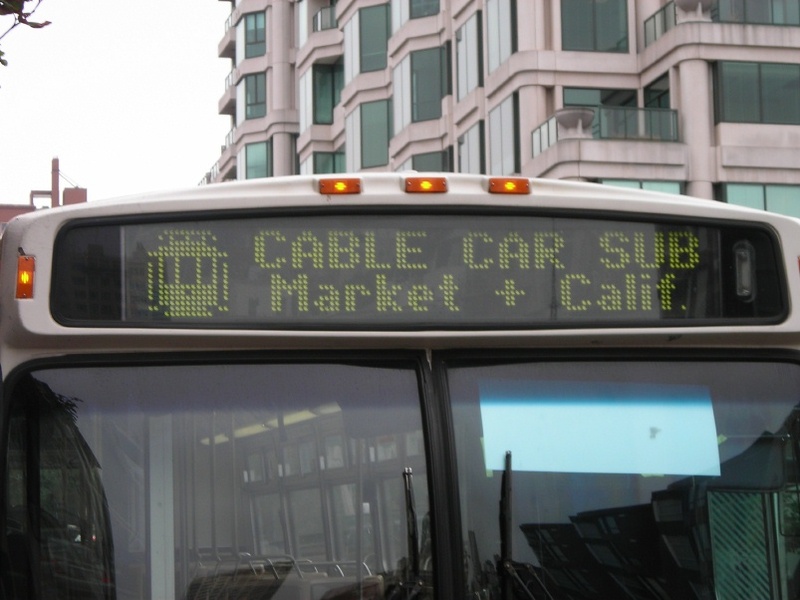 The company replaced Hyde Street service north of California with connecting shuttle buses that were rented San Mateo-Burlingame Transit Ford transit buses. 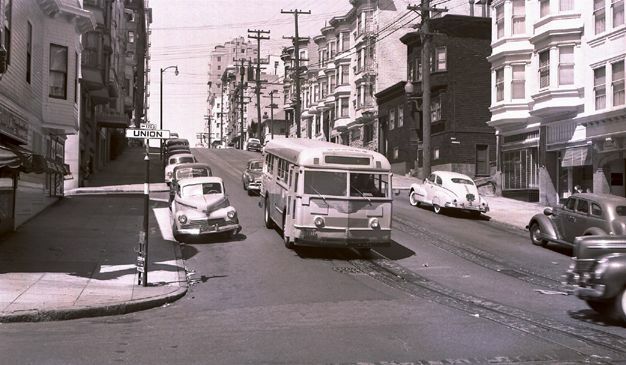 Shuttle buses only went north to Chestnut Street being incapable of operating on the steep Hyde Street hill. 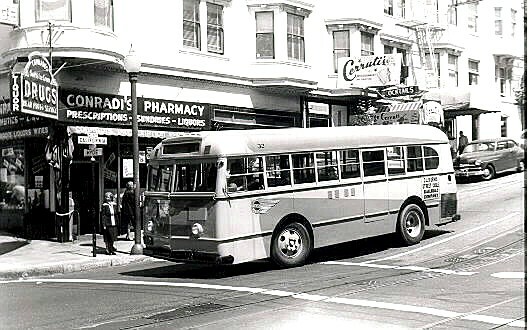 All buses in their rear advertising slots carried a signage that read "California Street Cable Railroad." San Mateo Burlingame Transit bus No. 32 is turning off of California Street onto Hyde Street. Bob Townley photo. All rights reserved. Transit bus No. 32 is turning off of Hyde Street onto Sacramento Street to loop around the block to reach its Hyde and California terminal. Bob Townley photo. All rights reserved. Transit bus No. 28 lays over at its Hyde and California Streets terminal waiting for connecting passengers from the truncated O’Farrell, Jones and Hyde cable. Bob Townley photo. All rights reserved. Inbound connecting Ford Transit bus has stopped at Hyde and Union Streets to pick up passengers destined to transfer in front of Cal Cable barn and powerhouse near California Street to the O’Farrell, Jones and Hyde cable car. 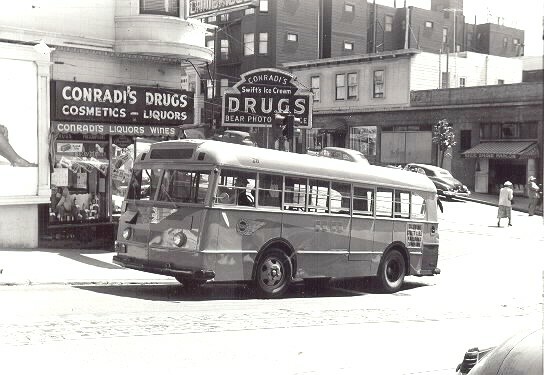 At Union Street the bus will cross Muni’s 41-Union-Howard trolley bus line (originally the designated as the "E" trolley bus). 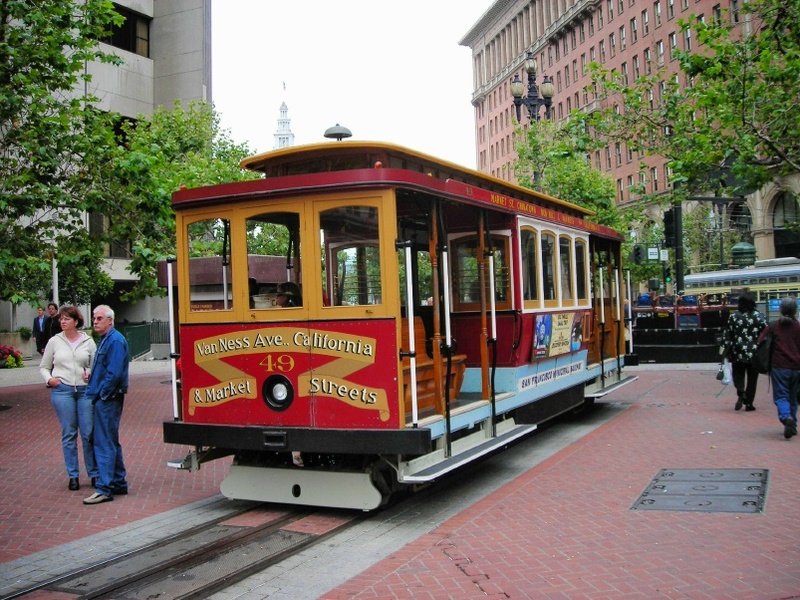 From January 1882 until April 1906 Union Street line was served by the Presidio & Ferries cable car line. 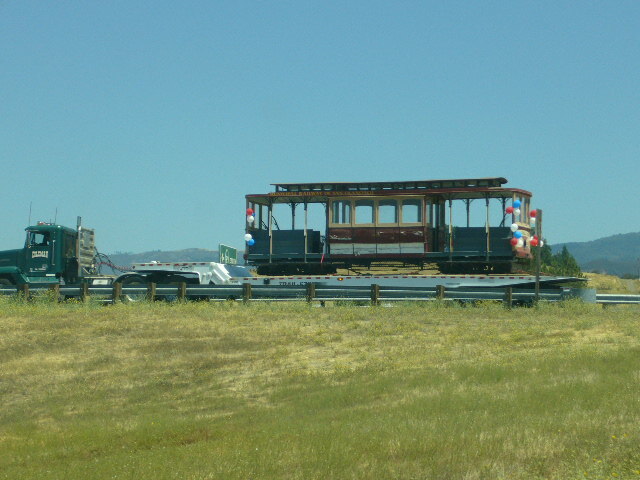 After the Earthquake this line was became a streetcar that in 1913 was purchased by the Muni becoming that company’s E-line. Walter Vielbaum photo. All rights reserved. 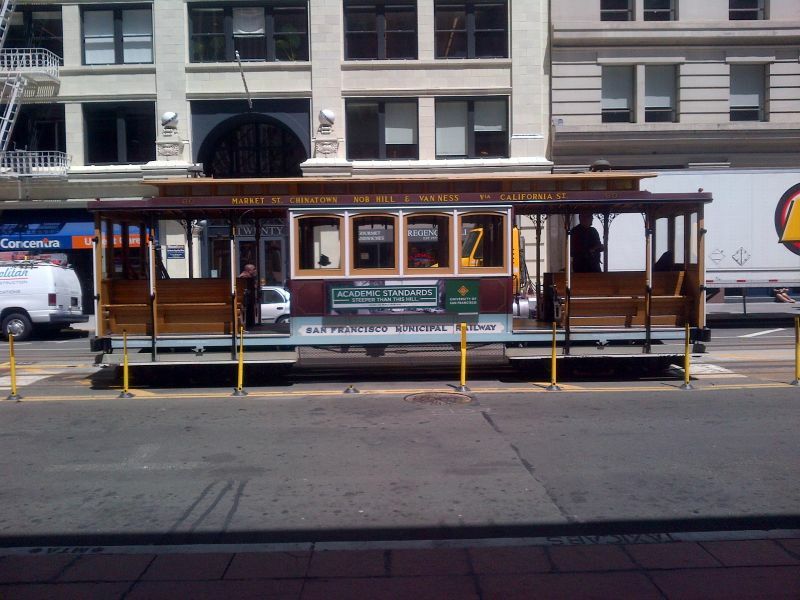 Route shortened Hyde Street cable car No. 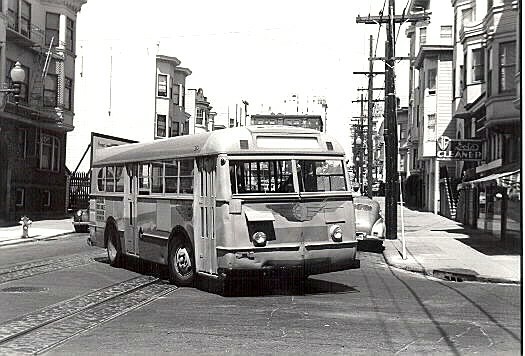 53 in this very rare photograph is on the crossover near the southern end of the Hyde Street side of Cal Cable’s car barn and powerhouse, located at Hyde and California Streets. No. 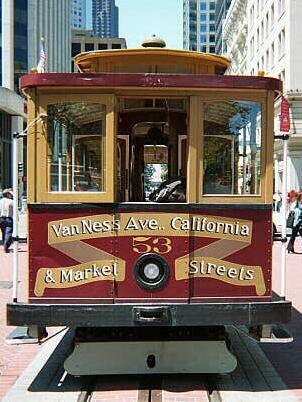 53 is heading to its downtown terminal of O’Farrell, Stockton and Market Streets. Some of No. 53’s passengers who rode a San Mateo-Burlingame Transit bus to reach the cable car will stay on to Market Street to shop at Macy’s. Note the shopman carrying a switch iron to set the switch. Walter Vielbaum photo. All rights reserved. Outbound California Street cable car 8 (now 55), painted in Muni green and cream colors, approaches Powell Street in the late 1950's. Muni colors were not popular on this car and the car was soon repainted in the traditional California Street maroon. Photo courtesy of Ron Westlund. Visit his DragoncitysMainPage. May, 1999 Picture of the Month. 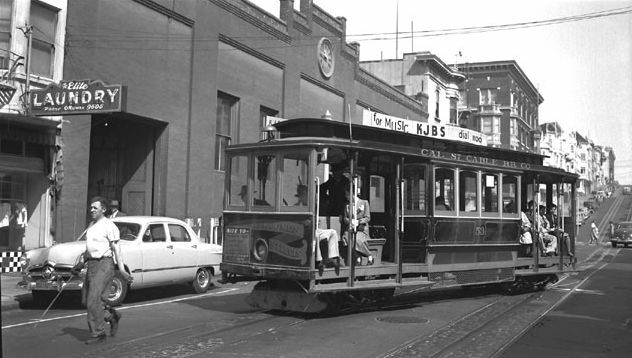 California Cable car 56 at Washington/Mason in 1973. Photo by Ray Long. Thanks to Ray for permission to use it. California and Drumm, looking West from the terminal of the Cal Cable main line in 1909 (source: [group 1:2] New San Francisco: Three Years after the Great Conflagration: Photographs, 1909, BANC PIC 1933.007 -- ALB, The Bancroft Library, University of California, Berkeley). 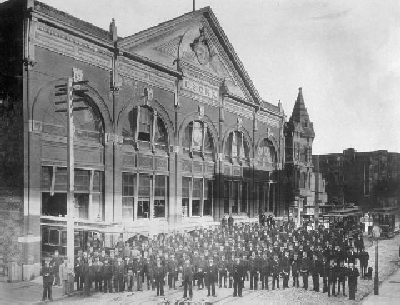 Cal Cable's second car barn at California and Hyde in 1895. This barn was destroyed by the 1906 Earthquake and Fire (source: [group 5:34] Jesse Brown Cook Scrapbooks Documenting San Francisco History and Law Enforcement, ca. 1895-1936, BANC PIC 1996.003--fALB, The Bancroft Library, University of California, Berkeley. 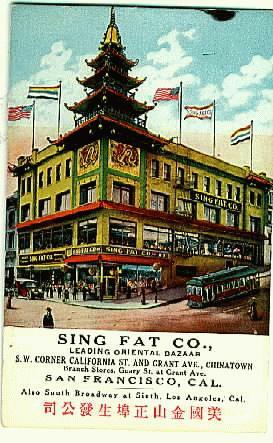 An advertising card depicting the Sing Fat Oriental Bazaar at the Southwest corner of California and Grant, after 1906. 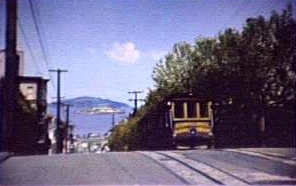 A postcard from before 1957 showing an O'Farrel/Jones/Hyde car on the Hyde Street hill. 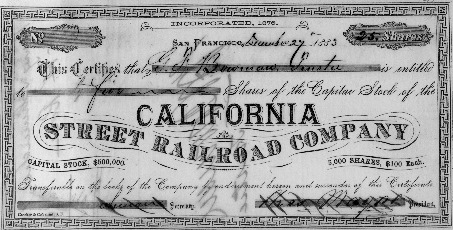 An 1883 stock certificate from the California Street Railroad Company. Car 53 at California and Drumm. July 2001. Photo by Joe Thompson. Car 54, where are you? California and Drumm. February 2003. Photo by Joe Thompson. Car 49 at California and Drumm. It looks remarkably clean and nice. May 2007. Photo by Joe Thompson. In June 2007, I was taking a training class at California and Van Ness. 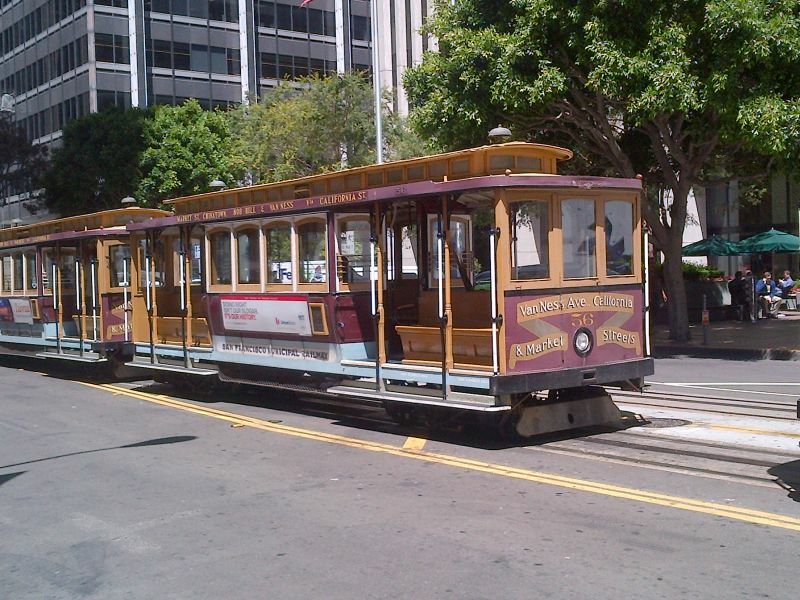 I looked forward to taking a California Street cable car every day. Unfortunately, they weren't running one morning, as this substitute bus tells us. Photo by Joe Thompson. 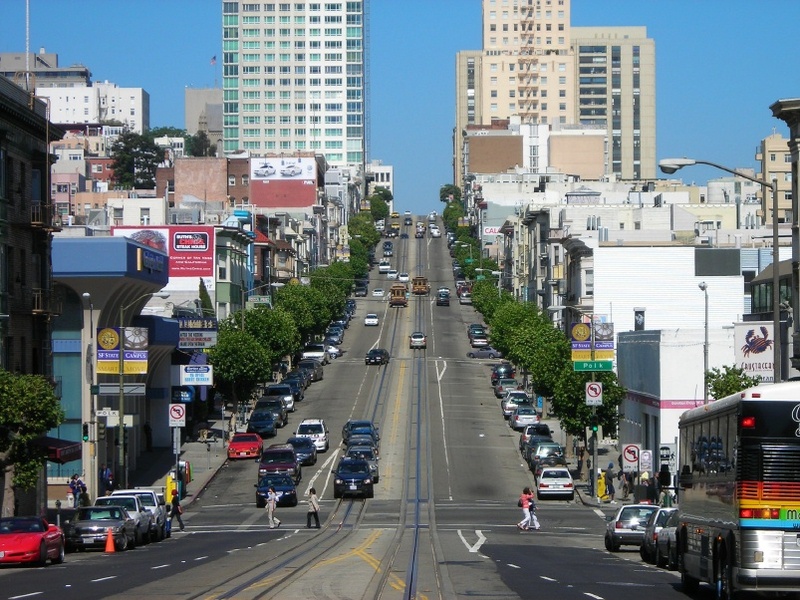 Looking east from California and Van Ness on a sunny afternoon in June 2007. 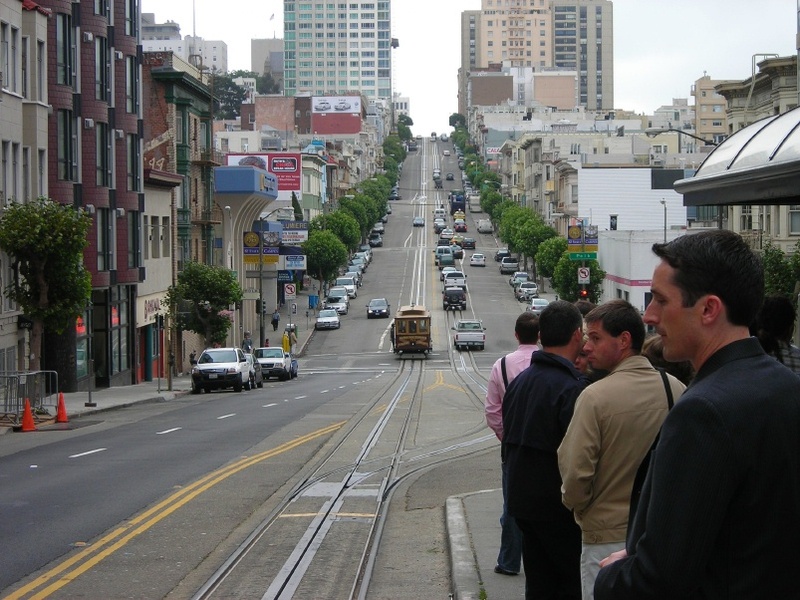 Two California Street cable cars are visible between Larkin and Hyde Streets. Photo by Joe Thompson. Looking east from California and Van Ness on a less sunny morning in June 2007. 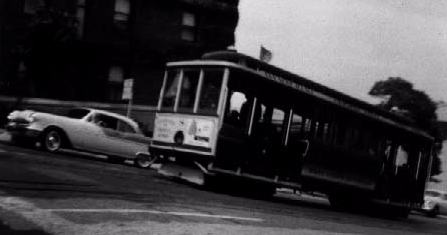 Car 50 (I think) crosses Polk on its way to the terminal at Van Ness. Commuters wait to board. Photo by Joe Thompson. Many cars were adopted during the Great Rebuilding of 1983-1984. Car 58 carries a placque from Wells Fargo Bank. June 2007. Photo by Joe Thompson. 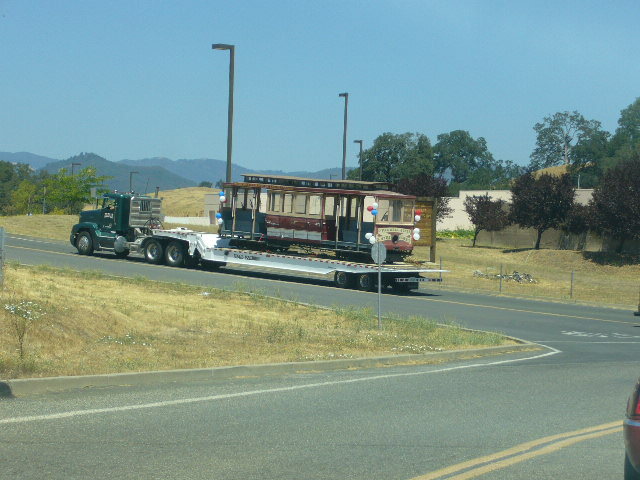 I was testing the camera on my new cell phone on 07-May-2014 and I came across Cal Cable car 60 laying over on California between Davis and Drumm. I was lucky because it was in the sun and there were no taxicabs parked in the curb lane. May 2014. Photo by Joe Thompson. June, 2014 Picture of the Month. Car 56 lays over on California between Davis and Drumm. June 2014. Photo by Joe Thompson. 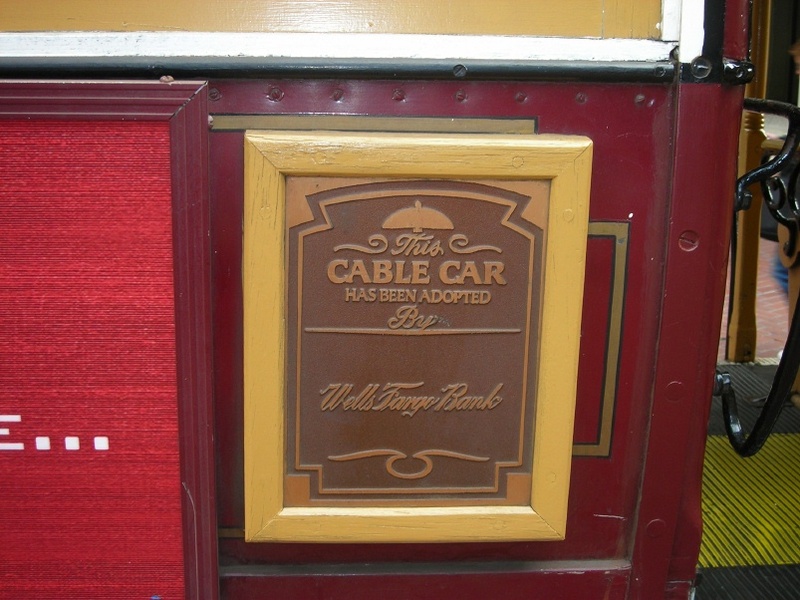 Car 54 carries a Citibank ad. 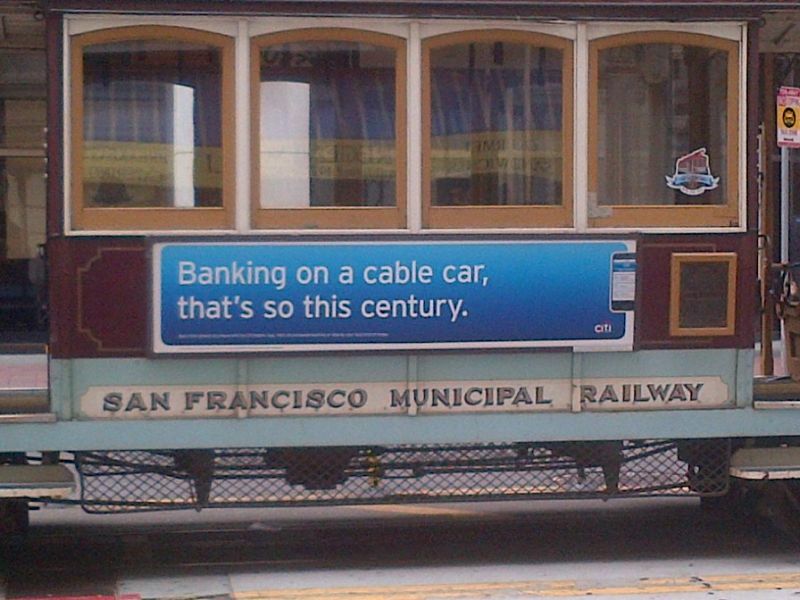 "Banking on a cable car, that's so this century." August 2014. Photo by Joe Thompson. Copyright 1999-2014 by Joe Thompson. All rights reserved.